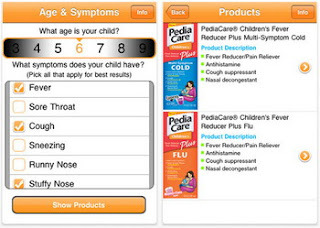 PediaCare has launched the new PediaCare Shopper's Guide, a free iPhone application that will help parents of children ages 1-11 select the product which best addresses the cold symptoms their child is experiencing. It will also help parents to understand which products require a dosage recommendation from a pediatrician based on age restrictions and will provide a link to the PediaCare web site for full product descriptions including dosage directions. While no app should replace the advice of a medical professional, this app and the many others geared toward parents are sure to help and save a lot of time! PediaCare Shopper's Guide for iPhone is available for download FREE on the App Store in the Healthcare & Fitness category. The iPhone app is not a diagnostic tool, but is designed for informational purposes only and does not constitute a medical diagnosis. 0 comments on "PediaCare Shopper's Guide iPhone app released on the AppStore"